Which type of bath to choose? Choosing whether to go for a freestanding or inset bath is a major initial decision. Freestanding baths require more space than inset baths because they’re not tucked neatly against a wall, so the size of your bathroom may force a decision on you. 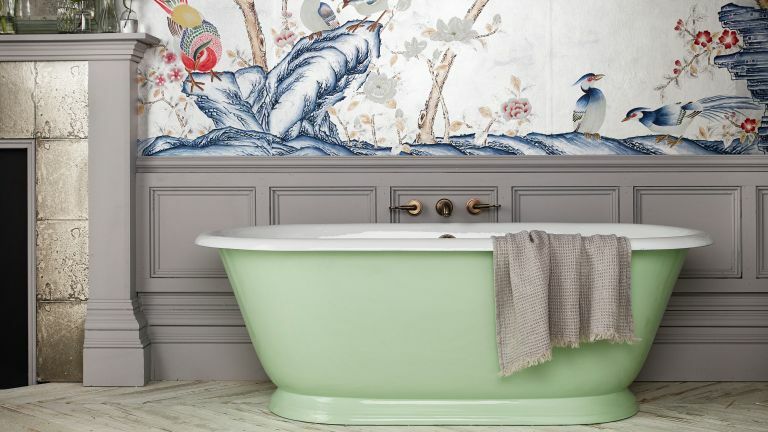 Freestanding baths may be positioned in the middle of the room or towards a wall, but, either way, they require space around them, so they’ll take up more of your bathroom than an inset version. Choose from modern versions of the traditional claw-footed tubs, or go for a contemporary style – either way, they come in a range of sizes. A freestanding bath is a fabulous centrepiece for a bathroom, but for those with young kids they can also be a practical choice giving all-round access. If you like the look, but space is tight, consider a back-to-wall or D-shaped bath. It has the shapeliness of a freestanding bath viewed from the front but takes up less of the floor area because it has a straight side that goes against the wall. Inset, built-in baths or straight baths can fit into smaller bathrooms, and are space-efficient in larger rooms as they sit against a wall and take up one or two corners of the room. They come in different sizes allowing you to choose a version the room’s dimensions will accommodate. Shower baths are like inset baths but have a wider end to make over-bath showering a more comfortable experience. Choose one if you don’t have the space for both bath and shower cubicle but a bath that’s wider at one end can be accommodated. If you prefer more sinuous lines in the bathroom, a P-shaped shower bath with a curvaceous showering end will meet your needs. Keen on crisp angles? Go for an L-shaped shower bath instead. Corner baths aren’t necessarily the super-sized bathing space the term might bring to mind. Those with equal dimensions on the sides positioned against the two walls are large, of course, but there are also more modestly proportioned offset baths where the sides are unequal in length. The latter create a tub that’s more roomy widthways than a straight bath. Consider a corner or offset bath to maximise space in the bath, as well as the floor area outside it, in square and near to square rooms. Whether you go for a freestanding or inset bath, there are both single and double-ended versions on offer. Single-ended baths have taps and waste at one end, so they’re designed for one person to lie in with feet towards the bath taps. Double-ended baths have taps and waste in the centre. They give a single user the choice of which way to lie, and they can be preferable for taller family members. They’re also ideal for bathing kids and sharers. If you go for a freestanding bath, you can select from traditional tubs and cutting-edge contemporary designs. Traditional roll-top baths may be raised on feet so you can see underneath the bath, as well as displaying the classic rolled rim. Not only do these features create a period look, but the feet can also help a small bathroom feel bigger as there’s more of the floor on show. Other designs have the same historic look, but have a plinth at the base, and suit larger rooms better. Slipper baths are asymmetrical freestanding baths. They’re raised at one end so the bather is supported and deeply immersed. They can be petite in size, making them a viable option in a space where other freestanding baths wouldn’t fit. Contemporary freestanding baths may be curvaceous or angular on the outside. Check out the inside, too, as a bath with softer lines could prove more comfy to use. Straight baths have a fuss-free presence and clean, modern lines. What are baths made from? The material a bath is made from can affect how you need to care for it, how durable it is, and even influence how long water will retain its heat. It also affects the weight of the bath, so bear in mind that the floor may need strengthening if you replace an old bath with a heavier version. Acrylic is widely used for baths, and a budget-friendly choice. It is easy to care for. It’s light, so can be preferable for the first floor of an older home. Steel is a very hard-wearing material for a bath. Be aware that its enamel coating may become chipped, although it can be repaired. It’s colder to touch than other bath materials, but will retain the heat of bath water. Cast iron is traditional for freestanding baths. It’s very hard wearing and easy to clean. Bath water should retain heat well in a cast-iron bath. It’s one of the heavier bath materials, so check whether joists will need reinforcing before installation. Solid surfaces like Corian and Hi-Macs can be moulded into shapely bath designs. They’re durable and easy to care for and will retain heat well. Stone baths are very attractive, although a more costly choice than other materials. They are also very heavy, so could have further budget implications as the floor may need to be strengthened. Don’t forget that you’ll probably need to buy the bath taps separately. The bath may come with pre-drilled holes, or none in which case it can be teamed with wall-mounted or freestanding taps, depending on the design. If you’re swapping from a built-in bath to a freestanding tub during a bathroom makeover and moving the bath to the centre of the room, be aware that a plumber will need to alter the pipework, so build this into your budget. Built-in baths can be finished with standard white panels, or tiles. Alternatively, wood panelling can introduce an organic note and warmth to a bathroom. Want bathtime to be a luxury spa-style experience? Invest in a whirlpool bath and soaking can be a massage, too. Take the advice of both a plumber and electrician if you want one of these, though. Looking for more bathroom renovation advice?